The ref. 15202IP with a smoked dial. Introduced as a 250-piece limited edition at SIHH, the titanium and platinum Royal Oak was an instant hit. The reason for its success is simple: it’s an appealing twist on the quintessential Royal Oak, the model that’s closest to Gerald Genta’s original of 1972. 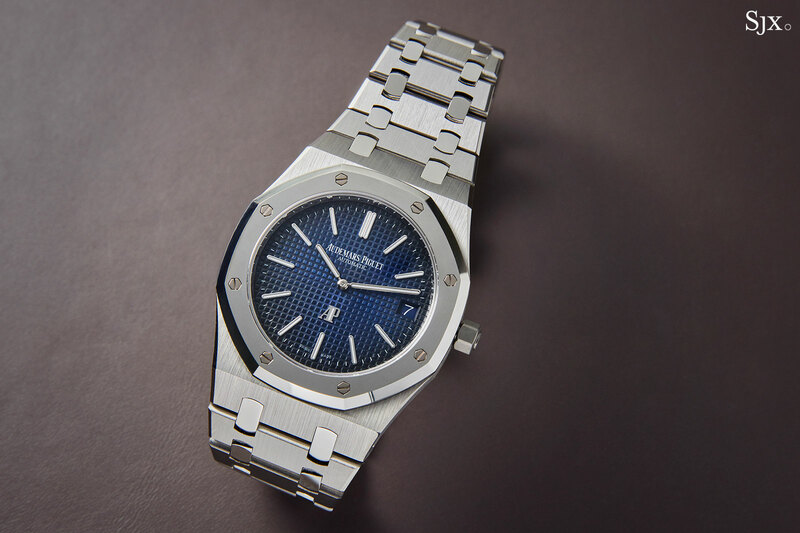 The combination of titanium and platinum – more titanium and less platinum – is not a new one, with AP having added platinum accents to various Royal Oak models in the 1990s and early 2000s, most prominently with the Royal Oak perpetual calendar. And just last year the face-lifted Royal Oak Chronograph was executed in the same two metals. But the combination has never been applied to the classic, 39mm Royal Oak “Jumbo”, arguably the one to have and typically only available in steel, rose or yellow gold (or combinations of the two), along with a rare handful in platinum or white gold. AP has upgraded the clasp on the modern day “Jumbo” to a sturdy double-fold, but that leaves the clasp feeling thick relative to the case. 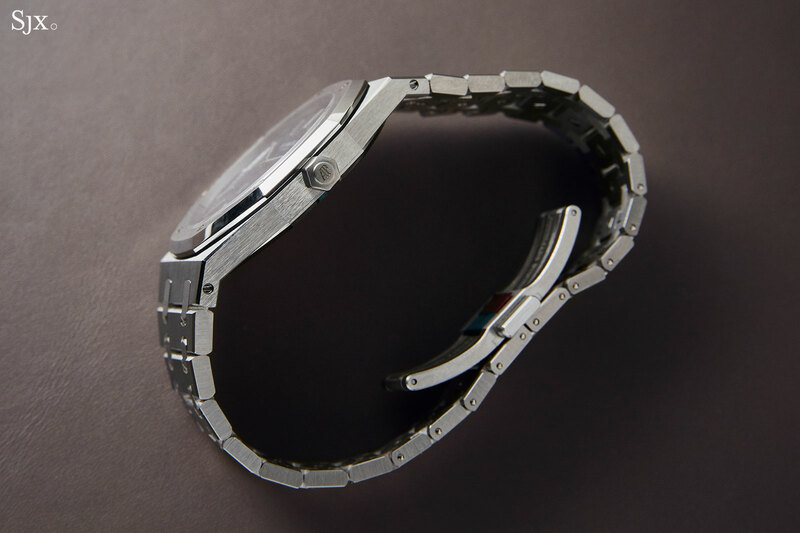 The platinum bits, namely the bezel and twin centre links of the bracelet, are distinguished with their mirror polished surface (which is what AP has always done to set platinum apart from other alloys in bi-metal watches). The shiny parts catch the lights nicely, though are obviously prone to scratches and fingerprints. After a day of being passed around at SIHH, the sample watch already showed the faintest of scuffs on the bezel. 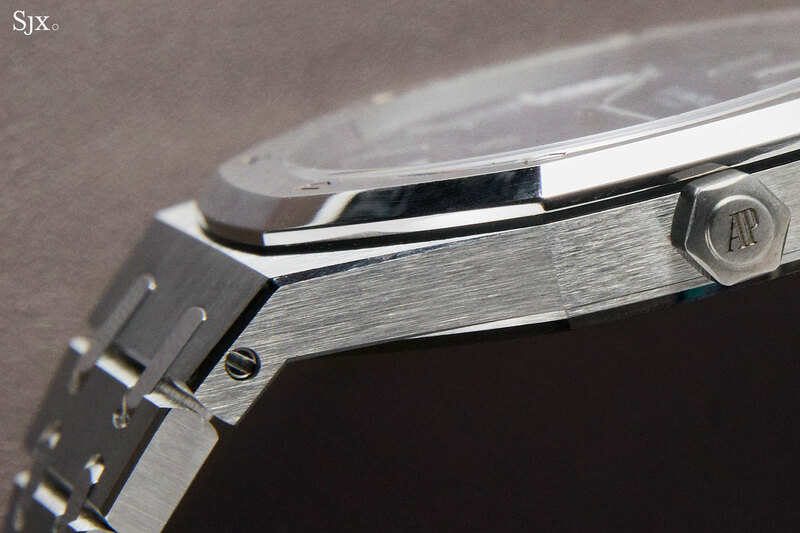 An intriguing solution would be to brush the bezel and give it a finish identical to that found on ordinary steel Royal Oaks. That appears to have been done in the past, with older models having appeared on the secondary market with bezels brushed by AP itself. 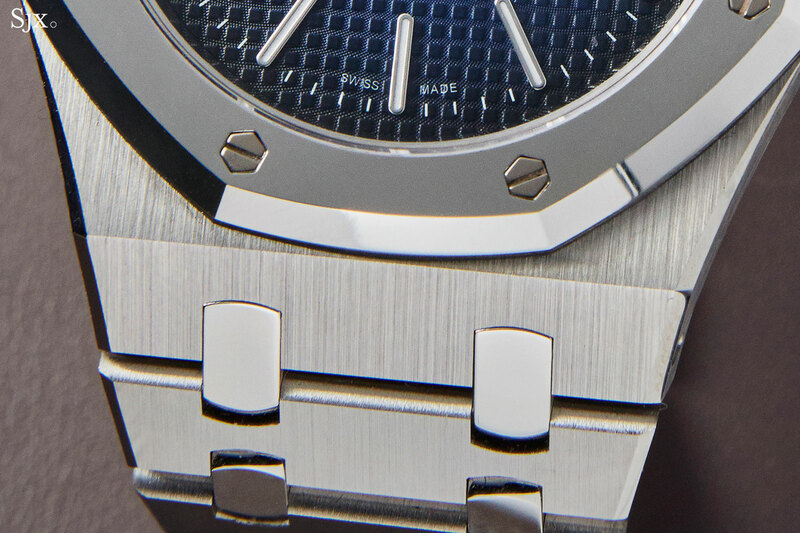 Though the case is titanium, the surface finishing is practically indistinguishable from that of the steel Royal Oak, which is to say it is done to an exceptionally high standard. The alternating brushed and polished surfaces are just magnificent. The fact that the case is mostly titanium gives it lightness, though the disparity between this and the steel model is not pronounced, since the steel version is relatively thin and light to begin with. The dial is equally unusual, having a graduated finish that AP labels “smoked”, and which other brands might term dégrade or fumé. It’s blue in the centre and darkens outwards, with the edges being almost black. The blue isn’t quite the same grey-blue as on the classic Royal Oak Extra-Thin, being slightly brighter. While the colour is different, the texture remains the same. It’s finished with the Royal Oak’s classic chequerboard tapisserie guilloche, which is still done manually on a rose engine (though the larger-square motif on the Offshores are stamped). Inside is the cal. 2121, the long in tooth but solid automatic calibre that was first introduced as the Jaeger-LeCoultre cal. 920 in 1967. It was found in the original Royal Oak (as well as the original Nautilus ref. 3700), but is now produced by AP in-house, having had modest upgrades over the years. Because of its slimness, just 3.05mm high, the cal. 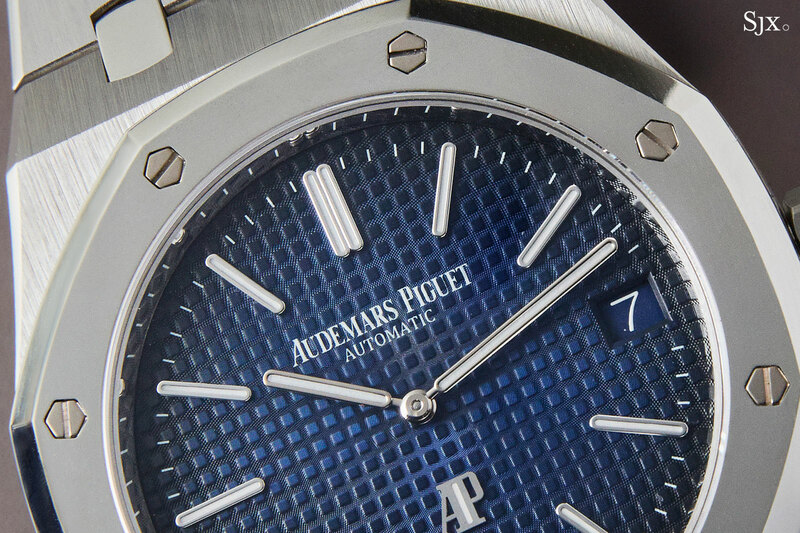 2121 is ideal for the Royal Oak Extra-Thin, since AP’s other calibres are too thin for the case proportions. Fine as it is, the cal. 2121 still suffers from a crucial weakness, which is the lack of a quickset date. That aside, the cal. 2121 is still one of the finest self-winding calibres on the market in terms of sophistication and slimness. Available only at Audemars Piguet boutiques, the Royal Oak Extra-Thin in titanium and platinum (ref. 15202IP.OO.1240IP.01) is priced at US$34,800, or S$48,800. Deliveries have already begun, albeit at a slow pace, so expect the entire run to be spread out over most of the year. Correction August 21, 2018: This Royal Oak was announced as a 250-piece limited edition, not 150 as original stated. Also the cal. 2121 is produced in Le Brassus, and not at APRP. 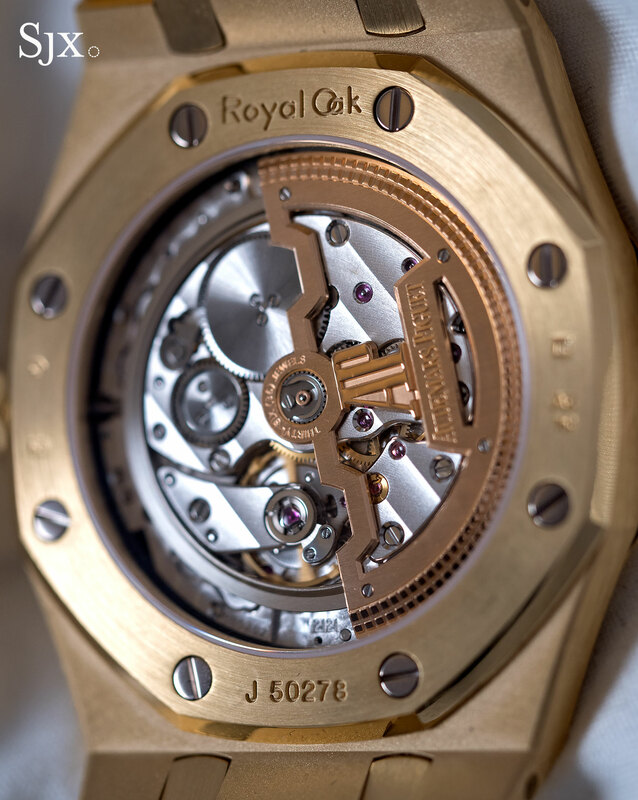 The Royal Oak "Jumbo" makes a comeback in yellow gold - and it's gorgeous. The classic colour of gold returns to the Royal Oak "Jumbo".